Whether you put their crate in your room or in another, that’s a different topic all together. Check out this article to see all you need to know about crate-training your new puppy. The carriers and kennels listed below are great for puppies because they're sturdy, easy to clean, and can easily be broken down for transport. One of them is extremely "zen" and quite stylish. The MidWest iCrate even comes with a special divider that allows it to grow as your puppy grows, which is a fantastically useful feature! Adding a cover to the crate: If you choose to use a wire crate, like the MidWest crate featured, you may want to consider adding a cover (make sure to choose the size that fits the crate you have). 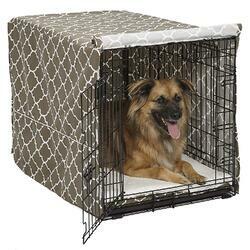 It's not necessary, but it could possibly help by creating a more den-like space for your pup. This would be a preference only your dog will weigh-in on. In that if your particular dog is helped by having their crate covered, this is likely a better option than towels, sheets, etc., as this fits more snuggly, possibly allows better airflow and, looks nicer, and is less likely to get pulled through and eaten. However, if your dog does have a habit of pulling their crate covers through and eating them, I recommend against covering their crate in general. The options recommended below are durable, comfortable, and waterproof, making them a good fit to cozy up the bottom of your dog's crate. And the recommended raised dog bed is not only comfortable, but a great way to get your dog off the floor of their crate, allowing for air circulation and a way for your dog to avoid laying in a mess if they have an accident. Make sure to give your pup plenty of exercise throughout the evening and before bedtime. If they’re just lounging around at night while you’re watching TV, they’re likely to get their ZZZs in early so they’ll be wide awake when you’re ready for bed. Spend a good 20–30 minutes playing with your pup (outside or inside) a couple of times during the evening. Not only will this tire them out, it will give them some always-important physical exercise. It’ll also help “get things moving” to help them “clear the pipes” before bedtime, so you’re less likely to find a fresh puppy mess in the morning or, worse, in bed with you. Additionally, mental exercise can help put them in a sleepy frame of mind. Consider giving your pup’s evening meal(s) from a puzzle feeder, and maybe try doing some work on their basic skill-training at night, too. Below are some of my favorite food puzzles and interactive feeders. They're fun for dogs and tricky enough to engage their brains, yet not so difficult that a dog will become frustrated and give up. While you don’t want to feed your pup right before bed, depending on their age, you may want to give them a small meal a couple of hours before bedtime, so they don't prematurely wake up hungry (again, consider an interactive feeder). If you want to get through the night without a puppy who’s whimpering to go to the bathroom — or wake up to a puppy who went to the bathroom anyway — it’s always wise to go for one last potty break just before bed. Chances are you don’t often stop whatever you’re doing right in the middle of it and go to bed. Most people have some sort of nightly routine, and the same should go for your puppy. Don’t expect them to know it’s time for bed and immediately get sleepy. Instead, start establishing a routine. Before bed, give them their final snack, try a few minutes of playtime, then follow with a late-night potty break. You can even lead them to their crate with a favorite toy. Whatever your routine, try to be consistent. The more consistent you are, the sooner they’ll begin to understand when it’s time for bed. They might even start to get excited about it. This Snuggle Puppy is cute enough to warm your heart but, more importantly, it'll give your pup some much needed comfort as they get settled into their new home. 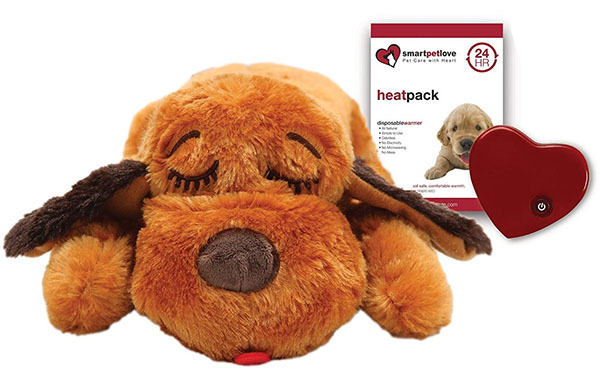 This cuddle buddy, with its “real-feel” heartbeat (which dogs can both hear and feel) and its gentle warmth heat source, is a "super stuffy” that really can help ease transitions for dogs. The reviews and photos people have submitted for this product are absolutely heartwarming, you really should check them out. Another important feature of the Snuggle Puppy is that it's washable (just don't forget to remove the batteries first!). And speaking of the batteries ... be sure to keep a close eye on your dog when they're first interacting and snuggling with their Snuggle Puppy! If your dog's idea of "snuggling" this toy involves mouthing and chewing, and disemboweling, be sure to take the toy away from them! Dogs destroying and removing the insides of any stuffed toy can lead to a digestive obstruction, but when a stuffie also contains batteries (as this one does), that presents a whole other level of hazard for a chew-happy pup! Other things like the smell of lavender and calming music or white noise can also be effective at sending your puppy off to meet the Sandman. The speaker below is great because it comes preloaded with over an hour of "Through a Dog's Ear," music that has been specifically created to help calm anxious or fearful dogs. Just like you, your pup’s sleep-wake cycles are influenced by melatonin, a hormone that is affected by the amount and duration of light in the environment. Melatonin is a sleep-inducing hormone and its production goes up when the lights go down. So turn off the lights in the room where your pup is sleeping. This means turning off the phone, tablet, and TV screens, too. 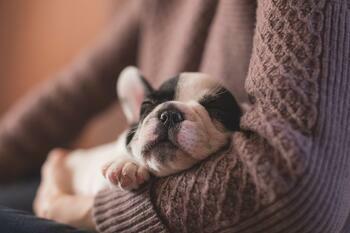 Most puppies will sleep through the night by the time they’re about 4 months (16 weeks) old. But with some help, diligence, and proactive training, you may be able to get your puppy there even earlier! Just remember, it’ll all be worth it in the end — for both of you.